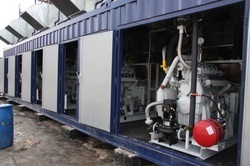 Lion Containers (Biomass) Ltd can offer shipping containers to the biomass industry for a variety of applications including anaerobic digestion biogas container stores. Biomass is put inside a sealed tank or digester. Naturally occurring micro-organisms digest the biomass which releases methane rich gas (biogas) that can be used to generate renewable heat and power. This helps to cut fossil fuel use and reduce greenhouse gas emissions. The remaining material (digestate) is rich in nutrients and can be used as fertiliser. Many forms of biomass are suitable for AD including food waste, slurry and manure, as well as crops and crop residues. The products of AD are referred to as biogas and digestate. Biogas can be combusted to provide heat, electricity or both. Simple and efficient installation methods. Speed of siting and ease of planning. Reduced C02 emissions compared to fossil fuels. Eligibility for funding under the governments Renewable Heat Incentive (applications can be referred to Ofgem). Strong, weatherproof and easily secured. Easily converted meaning that they can easily meet your bespoke requirements. 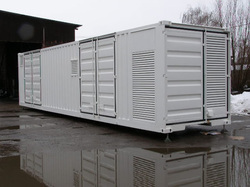 Cost effective, some of the larger units can achieve break even in under 5 years. Easily transported - if you move location you can simply move your plant with you. Available in a number of different lengths: 10ft, 20ft, 30ft, 40ft, 45ft as standard and can be fabricated to create anything in-between! Available as high cube options providing 9ft 6ins in height.